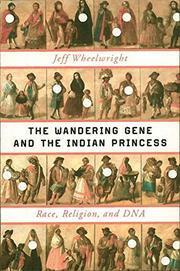 A freewheeling trip through Southwestern culture and religion, Jewish history and modern genetics. In 2008, science writer Wheelwright reported in Smithsonian magazine on the discovery in Catholic Hispanos in New Mexico and Colorado of a genetic mutation, BRCA1.185delAG, that is characteristic of Jews. The mutation, whose designation indicates that the letters AG are missing at location 185 on the gene, causes the gene to fail at its task of suppressing cancer. The author tells the story of the discovery of its ancient origins more than 2,000 years ago among Hebrew tribes in the Middle East, the dispersion of the Jews to Europe, the enforced conversion of many Jews to Catholicism under the Spanish Inquisition and the arrival of Spaniards in the New World. Into this large picture, Wheelwright weaves the story of Shonnie Medina, a young Hispano woman who carried the mutation, and of her extended family, possible carriers of the gene. Medina was raised a Catholic but became a Jehovah's Witness, a fact that allows the author to weave another thread into his complex tapestry. Other important characters include: Jeff Shaw, a genetic counselor who worked with Medina's family; Dr. Harry Ostrer, head of the Human Genetics Program at NYU and author of a paper on DNA and Jewishness; Stanley Hordes, author of a book on the crypto-Jews of New Mexico whose research was supported by the discovery of the mutated gene; and Judith Neulander, an ethnographer who disputed Hordes' claims. The cast is large and the story covers millennia, but with Medina and her family at its center, it is still small and personal. An intriguing tale told with gusto.